On July 11 the Nokia Zoom Reinvented event took place on Pier 19, New York City. At the event we got to see several mayor announcements that should increase Nokia’s Mobile market share, as its sales dropped by -4% compared to last year and is struggling to keep up with its competitors and It seems like its new strategy is Cameras. Camera: PureView 41 MP sensor with Optical Image Stabilization (OIS), Backside-illuminated image sensor, 6 lens optics, High resolution zoom 3x, Autofocus, Xenon Flash, LED for video, 1080p video at 30 fps, Includes Nokia Pro Camera mode and Nokia Smart Camera Mode. Here is a Gallery featuring some images from the event and from the new Nokia. 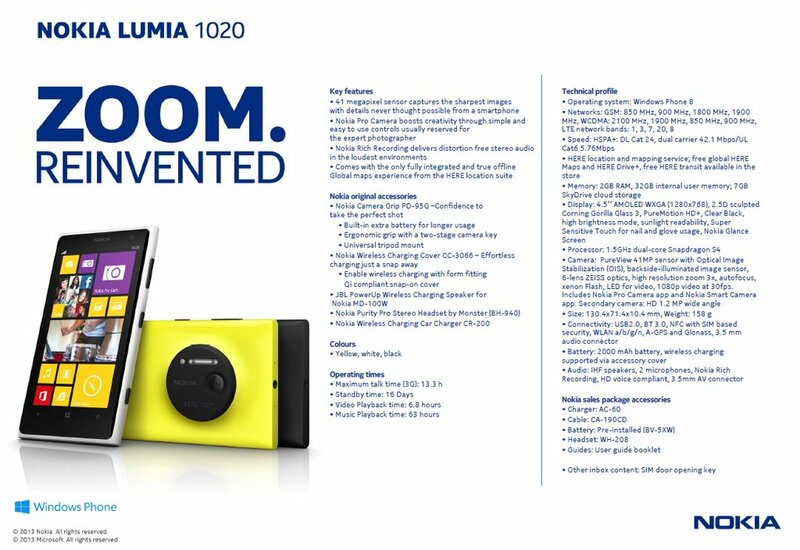 The new Nokia Lumia 1020 will be available in July in the U.S., the phone will only be available unlocked for $299 or can be bought exclusively at AT&T. Do you think the Nokia Lumia 1020 is more a Camera then a Phone? Will you be getting one? Share your opinion!